I swear when I read the opening headlines on the Cal sites this morning, my football-addled mind thought James Montgomery was coming back. Former Stanford and Golden State Warriors coach Mike Montgomery has agreed in principle to replace Ben Braun at rival California, according to a source with knowledge of the negotiations. Braun was fired as coach last Wednesday after 12 years at Cal. Montgomery led Stanford to the 1998 Final Four and helped resurrect the Cardinal into a national program. The move to Stanford’s chief rival comes as a surprise given Montgomery’s former and current links to the Cardinal. His former assistant, Trent Johnson, replaced Montgomery at Stanford. Most recently, Montgomery has been working as an assistant to Stanford athletic director Bob Bowlsby, as well as working in television for Fox Sports Net. Montgomery compiled a 393-167 record with 12 NCAA tournament appearances in his 18 seasons at Stanford, making him the school’s winningest men’s basketball coach. Here are my preliminary, uninformed, thoughts, which I move to strike from the record if I choose to. He’s old. I mean, 61 is old in college basketball. Even John Wooden didn’t last past 65. Bob Knight seems to have exhausted himself at 67. He’s ratched down for 6 years and $10 mil, which means he’ll be 67 when he’s done. Is he really going to fit in on the sidelines? Cal basketball certainly does not attract as well as Cal football does. He was terrible in the NBA. This doesn’t need much disputing, although the Warriors were a far worse team during this tenure. His resume speaks for itself–25 winning seasons, 10 NCAA tournament appearances. So we should at least make the bump back to a decent team. I think. I’ve heard some rumors about him being a so-so recruiter. Which doesn’t mean anything to me, since it’s not as if Braun was gifted in this realm either. Incremental steps is the term of the day, methinks. The commenters are going to have to be smarter than me here: What does Mike Montgomery bring to the table? 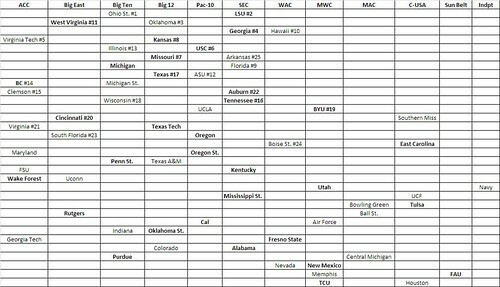 Extending with our deep and important discussion from regular season into bowl season, which conference had the toughest slate of opponents? Which conference had it easy goings? Well let’s look at the bowl performance. We can get a good examination by taking a look at this chart, with each row featuring a game, starting with the most important one and going down from there (I’m sure there are some contentions you can make at the end about which game should go over which, but let’s not be too technical). Winners highlighted in bold. So let’s analyze each conference as we did in the regular season post. Opponents of each conference are listed in order by the table (in the case of the ACC, #1 team in the ACC facing Kansas, followed by #2 team facing Michigan St, etc. ), followed by a W or L for win-loss. Now it’s the ACC’s turn to bite dust. The Big 10 was plagued with a terrible OOC schedule and no marquee wins; the ACC replicated that conference’s performance come the holidays. Most impressive win: Wake Forest knocking off 9-4 UConn. What sport is this again? Most embarrassing loss: Virginia Tech really never matched up well with Kansas, and the Jayhawks controlled the majority of the game. Even though it was only a three point win, the Kansas defense took the reins and didn’t let go. Leftovers: Florida State was playing without half of its players and still kept it close with Kentucky…Virginia blew the Texas Tech game (up 14 with THREE minutes left), but almost every team in the Big 12 blows a Texas Tech game, so we’ll give them a pass…Clemson lost to Auburn in the ho-hum Bowl, etc. etc. Toughness: 5th, making it all the more mystifying how badly the ACC performed. What the hell happened? You could argue that they were in each of these games until the end, but one would still think that they’d pull more wins out of these opponents than just two. Grade: D- (and there’s some serious grade inflation going on here). Most impressive win: Total emasculation for the conference was avoided by Florida’s unexpected meltdown against an energetic Wolverine attack. It was clear Rich Rodriguez had already made his presence felt as Michigan went to the spread, lived by the spread, KILLED by the spread. Welcome to speed, Big Ten. Most embarrassing loss: The Illinois game was over in a matter of six minutes. When the hell are the SEC and the Pac-10 going to play in the Rose Bowl again? Other game notes: Michigan State barely finished over .500 and took a highly ranked BC team the distance. Wisconsin-Tennessee came down to the final drive. The other victory against a big conference came against a team without a coach, which is about as impressive as it sounds. I heard the Purdue-Central Michigan game was entertaining, if you really really hate defense. Toughness: To be fair to the Big 10, they drew a very tough slate of opponents, in my estimation the toughest in the country–three ranked SEC opponents, the Pac-10 champ and the ACC runnerup. They weren’t facing cupcakes here like they were in the regular season. Nevertheless, while the second-tier bowl games were at least competitive, it was clear the top of the Big 10 could not keep up with the best of the Pac-10 and the SEC for the second straight year. Top 4 after the jump. Technical difficulties expected this afternoon, so just hang in there while you keep on clicking that Allison Stokke post through the roof. Turf Wars: How Much Does the Surface Affect Cal? I conclude this week by talking about grass. No, I’m not talking about the bums on Telegraph, although that would make for great interviewing. Is there something in the grass fields of college football stadiums that slows our players down and eventually knocks our team out? I bring this up because Cal football is a mysterious and painful 0-6 on grass the past two years during the regular season. I repeat: WE HAVEN’T WON A SINGLE GAME ON GRASS THE PAST TWO REGULAR SEASONS. Arizona, Tennessee, USC, UCLA, ASU, Stanford. Three of these teams were good, one was so-so, the other two flat-out stunk. We’ve managed to win our last two bowl games on grass, but it was not typical Cal football in those two games–we utilized a great power run game to throttle A&M and needed a miraculous comeback speared by Kevin Riley to take down Air Force. Neither of those games was decided until the 4th quarter (and yes, Cal won the Holiday Bowl by 35). So it’s safe to say we’ve been struggling on turf. Perhaps this LA curse now has a partial explanation. Both the Rose Bowl and Coliseum are grass surfaces. The 2006 season looks a little disconcerting in retrospect. Cal on turf? 9-0. Cal on grass? 0-3. The terrible Oregon State loss was compounded more by the fact that we had to go to the Rose Bowl and Sun Devil Stadium and lose two more–both grass fields. The Bears this season on the natural stuff were 0-3, stagnating on offense late in each of the three games. Since Tedford arrived at Cal, in the Pac-10, here are his records on turf and grass. Note that in 2003 and 2005 (offensively sluggish, defensively solid years for the Bears) were the only years Cal football teams finished with winning records. After the jump, a possible explanation of the disparity between the two surfaces. This weekend I went about twelve rounds with Hydrotech from the California Golden Blogs over my playcalling posts (Part I & Part II of his ripostes are here). We both had errors in our logic (I think I said USC was in a 5-2 when it was clearly a 4-2 on the Forsett TD, he said that playcalls can be considered good regardless of the result, which is a logical fallacy of some sort) and met halfway, but I think we still left disagreeing with one another about something important. Oh well, that just means more posts about it until I go utterly crazy. To shift gears on the game film (and avoid another crazy debate for at least a week), we’ll try a more lighthearted review of tape. I was pretty serious about my USC posts, but here is something lighter from a lighter time, our glorious Tennessee victory and good ol’ reliable Robert Jordan. Very fun call by Tedford on 3rd and goal against Tennessee with five wide receiver spread, game tied at 21–in this case, two tight ends (Morrah and Stevens lined out, Forsett far out, the two wide receivers Jackson and Jordan lined inside). 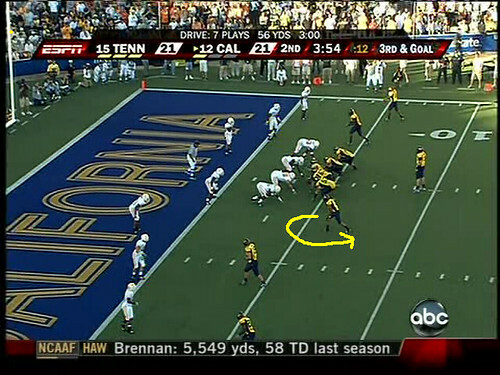 Instead of aiming for the end zone though, Cal will choose the indirect route and go for some vertical misdirection. However, there will be one pressing question after this one: What the hell was the defender thinking? Although you have no idea what I’m talking about, you’ll see what I mean in a minute.